Dealing With Pesky Clogs in Your Drains? Are your sinks and showers slow to drain? Do your toilets seem to take a long time to flush? If this isn’t an isolated problem but rather one that affects your entire home, you may be dealing with a clog located in one of your sewer or drain lines. These clogs can have all sorts of negative consequences, including possibly contaminating your water supply. This means the longer you wait to eliminate the clog and solve the problem, the worse-off your home will be. An experienced plumber at the best hydro-jetting service company in San Diego can solve the issue quickly and get your home or business running smoothly again. Why Choose Independent Plumbing & Drain? Since 2010, these qualities have guided us in our business operation and helped us build a reputation as one of the leading plumbers in the area. We offer a complete range of plumbing services for both residential and commercial installations, no matter how large or small. We recognize that the issue you’re dealing with is extremely important to you, and it deserves to be treated as such. This is why we perform every service with the same care, quality, and attention to detail that you would come to expect if we were fixing our own home. Need your pipes hydro-jetted? Call Plumbing & Drains Solutions today at (619) 345-5550 and ask to receive a free estimate. Eliminating clogs in a drain or sewer main line wasn’t always an easy job, but hydro jetting has significantly improved the process. Hydro-jetting is a rather simple solution to the issue of clogged or congested drainage pipes. Hydro-jetting is the process of jetting a stream of water under high pressure through your pipes, wiping out that residual build-up and increasing the efficiency of your drainage pipes. This head uses a stream of water under tremendously high pressure to decimate any clogs or blockages that may have formed. Other jets located on the head also blast the sides of your pipe with water, cleaning and clearing away any grime, debris, or oil that may have collected. Nothing stands before the power of this kind of water flow; debris, sand, tree roots, grease, it doesn’t matter, it will wash it all away. No need to dig up your property to make the repair. Over time, even the best kept drain systems may develop a build-up of residue that results in not as much water being able to run through them at any time, slowing down your drains and it may be time for a drain cleaning. In time this residue can actually build up to the point that it can be the cause of actual drain blockages, much in the way that arterial plaque can build up and cause a person to have a heart attack. 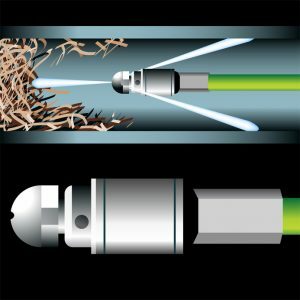 Hydro-jetting (or ‘jetting as it is more often called) is often recommended in the case that using a drain snake does not completely clear the blockage, or if the blockage is too heavy or thick for a drain snake. But it is also a standard procedure prior to sewer lining to ensure that the epoxy lining will be able to connect the drain to the sewer line effectively. It is also used by many homeowners and property management companies as a preventative measure to ensure that the drain lines remain in top condition. In the past, plumbers would simply run a line up your sewer pipe to bore a hole in the blockage, but that option rarely eliminated the cause of the problem, and it was only a matter of time before the clog returned. Hydro jetting takes care of the issue at its source so your lines run free and clear for the long-term future. The experts at Plumbing and Drains Solutions have the knowledge and expertise necessary to remove even the most stubborn of drain blockages. The jetters used by our professionals use an incredibly high water pressure to clean out the build-up in your drains and any debris that may be accumulating throughout your system. 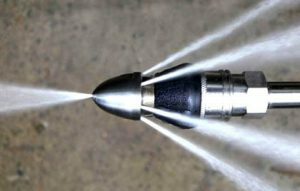 Quick and effective, hydro-jetting does not take long and has the decided advantage of being a preventative measure to keep your drains running smoothly. So if you are having recurring issues with your drains; either drains that repeatedly back up or drains that are sluggish and slow on a regular basis, you may want to consider our hydro-jetting services. We are the best hydro-jetting service company in San Diego that can provide hydro-jetting services. Call us today for a plumbing service estimate from San Diego’s top rated plumbers. If your drains are running slowly, contact Plumbing & Drains Solutions now to schedule a hydro-jetting service!